Instead of calling printf(), it is calling putchar()! Why is that? The reason is that the gcc compiler tries to optimize things as much as possible. In case of using printf() for a single character, it replaces it with a call to putchar() wich is much more efficient and smaller. So depending on what the compiler is able to optimize, other low-level functions will be used. If using semihosting or custom low-level I/O libraries that might cause linker error with missing functions. 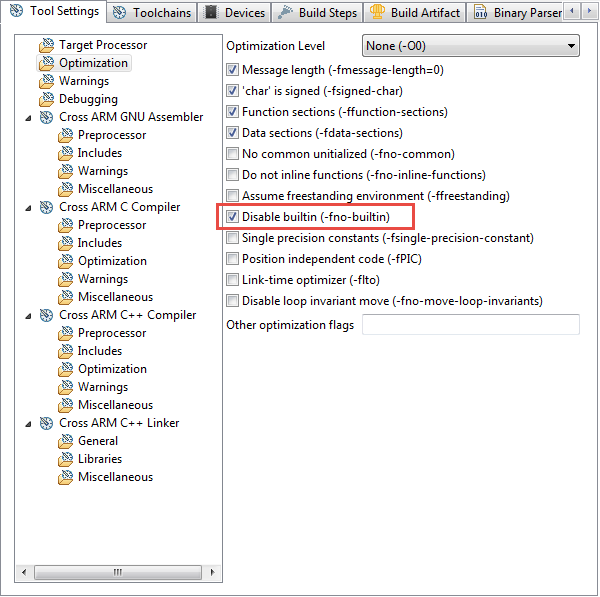 This entry was posted in ARM, Building, CPU's, Embedded, gcc, Tips & Tricks and tagged arm gcc, Assembly, Building, gnu gcc, software, technology, Tips&Tricks, tool chains by Erich Styger. Bookmark the permalink.